Think we’re recruiting for offense or defense? Looks like he plays RB and MLB. Way to go, Coach Mitchell!! Didn’t realize we had 9 years of losing seasons when you were brought in. That’s a big hole to dig out of. Go Mean Green! Convinced the family to come with me, plus a friend. Total of 6 headed up tonight! Thanks for the Throwback Thursday discount AD!! 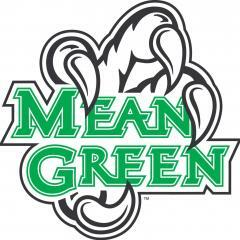 Go Mean Green! Hopefully the next 2 years can be smoothed over with the JUCO and transfers available. This is a great looking class! Now they can spend the spring starting to line up the 2020 class. Should be easier convincing the three-star folks to look at us. What if they landed a four-star?!? So, to clarify, is it easier for a coach to recruit to a 1-11, 5-7, or 9-4 year when you also have an Indoor Practice Facility under construction and multiple "largest donations in program history" within the past several months? Oh, plus record single year attendance numbers for Home Games? Good grief! People act like it's all about the salesman. Sometimes it's about the product too. So we go into the game underdogs to a Top 25 team. Everyone I read said it would be a shootout type game with the defenses struggling to stop the offenses. Then we find out our leading receiver is out before the game starts, and our high profile, stat leading QB goes out in the first quarter. So now our defense will struggle even more, because our offense won’t stay on the field to give them a break. Winning would have been a stretch anyway, but everyone acts like we still should have gone toe-to-toe with a Top 25 team with our offensive all-stars on the sidelines. I love that expectations have risen so much, and it was a frustrating day, but the sky isn’t falling. We DO need help in the trenches on both sides. The last 3 years have given a new era of students a reason to become lifelong fans. Let’s continue to build this thing. Go Mean Green!! Put in the dancing QB!!!! Well that wouldn't be good. Are the seat Nazi’s less strict now maybe? Don’t force students to sit in the student section? Maybe a decision was made to let the students just go wherever to make the Pit feel like it had a better crowd during Benfors years, or something. They don’t have the Pit Crew? So Draper came in and got a quick 6 points in the first half, and then I had to stop listening. Did he not go back in? 10-1 is legit. Take the wins. Team continues to learn to battle. Go Mean Green!! Seth Littrell is the man! I would pay good money for an autographed helmet like this. They have some in the Spirit Shop?